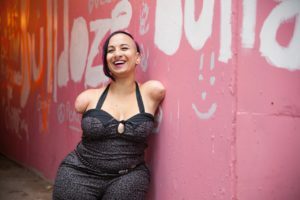 Though Talli was born missing her arms and stands at just over three feet tall, she was raised with the belief that she could do anything she wanted to, and this determined attitude is exactly how she lives her life. At 13, Talli started volunteering with the War Amps of Canada’s CHAMP program (something she does to this day). And so began Talli’s passion for inspiring others. As a teenager she became a mentor for people with physical challenges. This lead to Talli being the sole Canadian featured in Teens with the Courage to Give, a book comprised of 30 stories of teenagers overcoming the odds and being an inspiration to their community. More recently, Talli has shared her story with many students across the country, she has been the keynote speaker at many corporate events and loves spreading inspiration to teen groups and girls clubs. While Talli’s interests are in helping others and inspiring change, she was at Virgin Mobile Canada for almost 8 years, where she was awarded Best Customer Service Agent in the Americas, as well as Third Best in the World. Talli was also presented with the Virgin Stars of the Year Award by Sir Richard Branson himself. More recently, Talli received a video endorsement by Richard Branson, putting Talli in his Top 10 Most Inspirational People and was featured on Richard’s personal blog at Virgin.com. Another of Talli’s loves is music. Talli is recognizable in many punk scenes around the world, and for the last five years she’s fronted her own melodic-punk band, performing in many landmark venues in Toronto, including The Bovine, Sneaky Dee’s and the Kool Haus. But it’s in motivating people where Talli is most at home. Early last year Talli was approached by CBC to talk about her experiences with bullying. Always the optimist, she brushed aside any notion that she was a victim, instead taking the opportunity to stress that, with the right confidence and attitude, anyone can get passed being bullied. Talli feels that being an inspirational speaker was something she was born to do. She loves changing perceptions and attitudes, and sharing her stories with others. As Talli says, she wants to spread inspiration, love and punk rock, across the globe, one talk at a time.